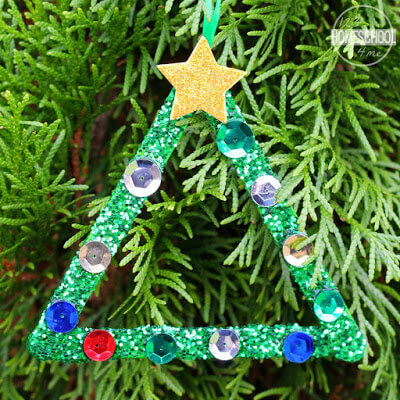 Are you looking for a simple Christmas tree ornament to make this year? 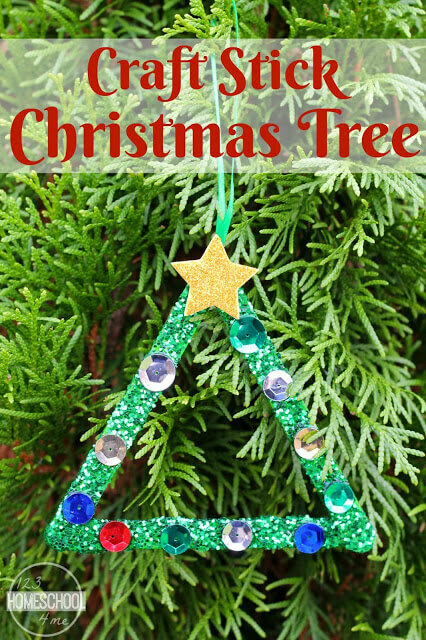 This Craft Stick Christmas Tree Ornament is fun and easy for young children to make. These colorful ornaments are sure to brighten up your Christmas tree too. This simple craft stick Craft Stick Christmas Tree Craft is sure to be a precious memory hanging on the the tree this year. One of my favorite things about this easy-to-make Christmas craft is that it is inexpensive to make. If you don’t already have the supplies at home, you can find everything you need at the dollar store. This simple holiday craft requires very little preparation too. Simply spread the green paint onto a small paper plate and lay out the rest of the materials for your students. 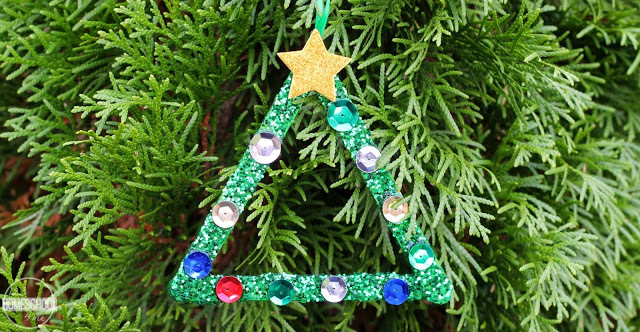 To begin making this Christmas craft, glue the ends of the craft sticks together to create a triangle. 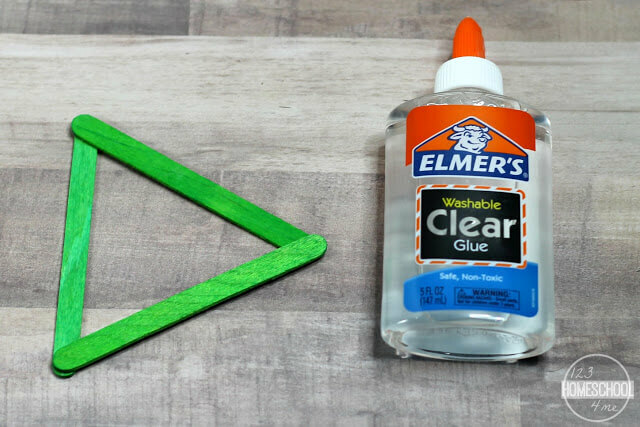 After the glue dries, paint the craft stick triangle with the green paint to create the Christmas Tree. After the paint dries, add green glitter all around the ornament. If you don’t have green glitter, you can use white or even clear so it sparkles on the Christmas tree. To apply the glitter with littlest mess, mix the glitter with glue and let the students paint the glue on the Christmas tree. 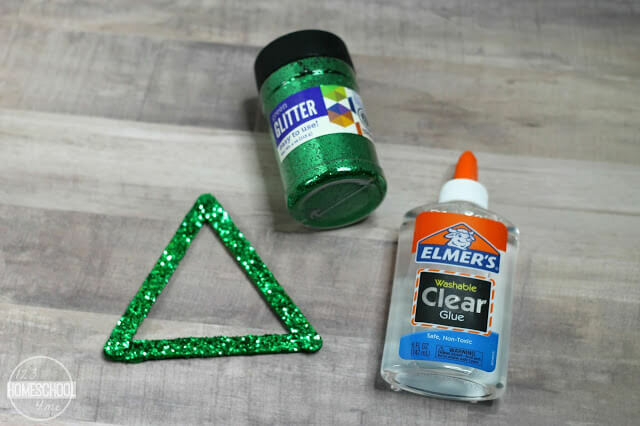 You can also put the triangle in a box such as a shoe box and have the children sprinkle the glitter on top of Christmas tree after the glue has been applied. 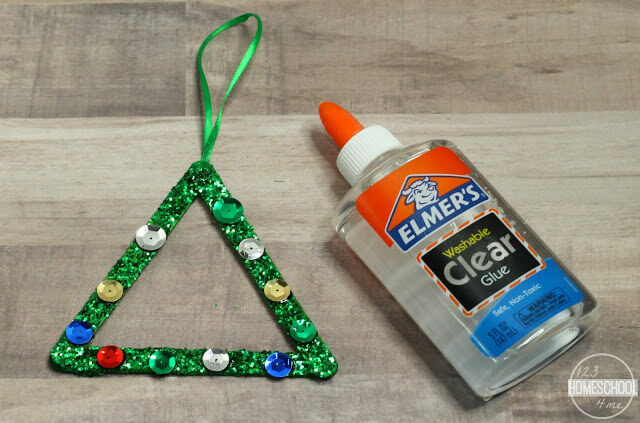 After the paint dries, glue sequins around the triangle for the Christmas ornaments. Instead of using sequins, you can also use mini pom poms, jewels, or even hole punch circles out of different colored paper. Next, cut a star out of the yellow craft foam and glue it on one of the points of the triangle. To save time, you can also buy pre-cut foam stars if you are making this craft at a holiday party with a large group of children. Finally, cut a piece of ribbon about five inches long. Fold it over to create a loop and glue the ends on the back of the craft. After the glue dries, this Christmas tree ornament is ready to hang on your tree. This Craft Stick Christmas Tree Ornament is a creative way to make a special keepsake ornament from materials that you already have at home.